Welcome to Just Tyres Aylesbury, where we only supply and fit tyres for cars, 4x4s and vans. This means we offer you expert knowledge and a wide choice of tyre brands. Aylesbury tyres available in a range of locations. Our Just Tyres Aylesbury Fitting Centre is just off the A41 Gatehouse Road situated close to White HillPark. Based in the Gatehouse Industrial Area in Aylesbury, the Tyre Fitting Centre can be easily accessed by the A418 and A413, the main entry roads entering into Aylesbury. Whatever tyres you decide on, our highly trained team can have them fitted quickly fast, and our Aylesbury centre is convenient and easy to find on the Gatehouse Industrial Estate. Our experienced team never use airguns; we work manually to ensure you can change yours in the event of an emergency. 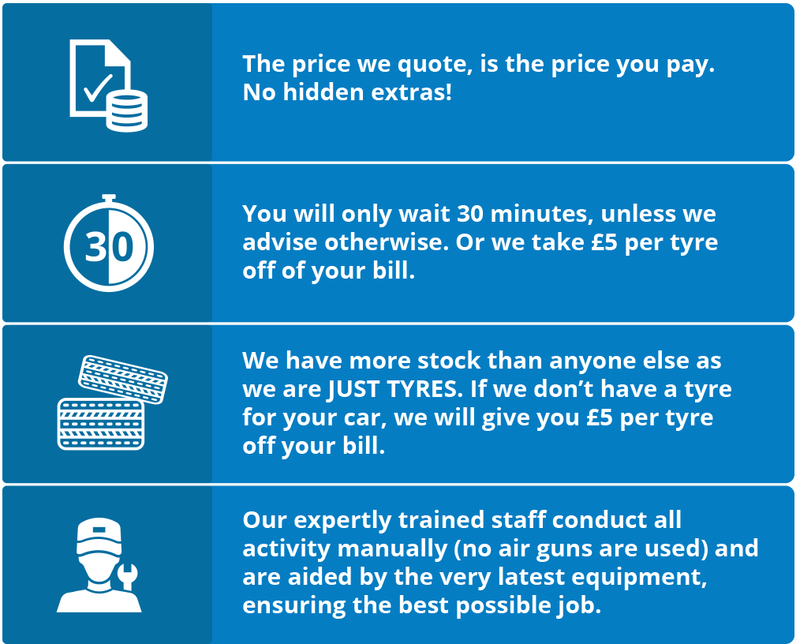 We're confident that we can fit your tyres quickly and efficiently, and you'll be given £5 per tyre off your bill if you're made to wait any longer than 30 minutes. There's an extensive range of brands to choose between on our website, and once you have made your decision, you can select the Just Tyres Aylesbury centre and choose your preferred date and time for the appointment. Just Tyres has budget, standard, premium and super premium products available, so whether you need precise handling in winter conditions or a model that offers outstanding braking performance in the wet and dry, we can help you choose the right set for your unique driving style. Finding quality tyres in Aylesbury has never been easier, and when you make a search using the tool on our homepage, you'll be presented with a list of relevant products. The price stated is the price you pay and there are clear EU ratings on all of our products. Our friendly team are always on hand to guide you through the options if you're entirely sure on the product you require, and you can also get a quote on a particular product by filling out our online form. We're regularly releasing special offers on premium and super premium ranges, and we can keep you up to date with the latest promotions when you subscribe with us. Our lowest price guarantee ensures customers can refund the difference on a product you find elsewhere at a cheaper price. The only stipulation is that you must provide a current and local (within 20-mile radius) advert or written quote for the tyre you purchased (within 7 days). To find out more about our fitted and delivered tyres in Aylesbury, get in touch with us today on 0845 456 9903. You can also contact us via email or by using our online chat service.